Cushions and throws add a touch of texture, providing a warm and cosy feel. Dusky colours can be mixed and matched with various shades and patterns to create a variety of looks. Partner your Truffle decor with pastel pinks or mocha hues to create a rich and luxurious feel. 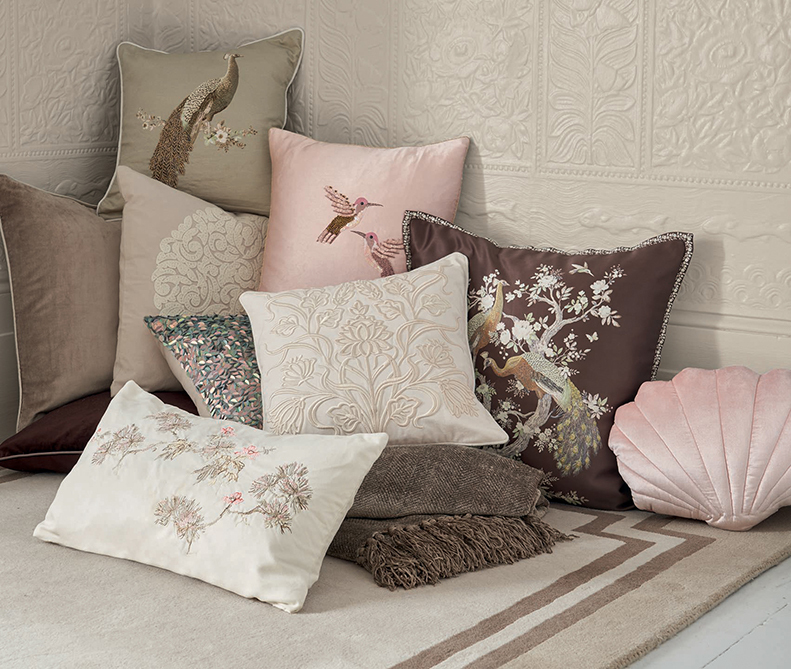 Our gorgeously soft Mia Cushion features embroidered detailing for a look you will treasure. With a feather pad included, you can create plush, comfortable spaces instantly. If you’re looking to make a quirky decor statement, add in a pop of blush with this Hummingbird Cushion, a guaranteed conversation starter. If you’re looking to make a statement, then our best-selling Belvedere Wallpaper in a newly recoloured Soft Truffle shade is the option for you. 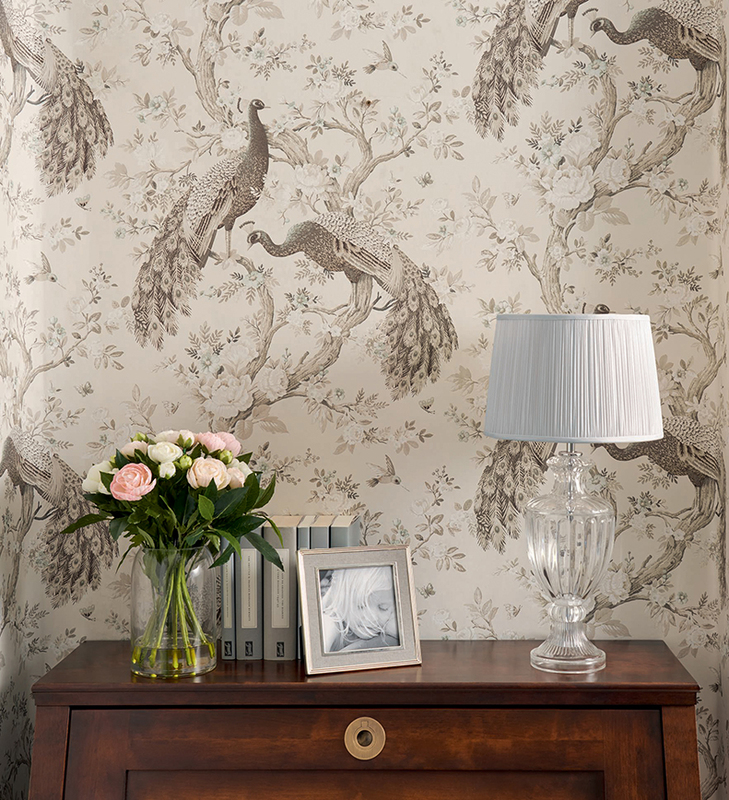 Featuring an elegant peacock design combined with timeless florals, this wallpaper is the perfect addition to a luxurious space. Also redesigned in our new Paste the Wall technique, this method is the easiest way to apply a new interior look. Simply paste the wall, hang your paper, and leave to dry. It’s easy to remove for a new look too, but we think you’ll want to keep this wallpaper around for years to come. No home is complete without a few eye-catching accessories to set the tone. Our gorgeous Belvedere Pattern fabric is given new life in beautiful soft truffle brown. Rich and intricate, make curtains, blinds, or cushions to personalise your home. Bring the elegance and grace of the peacock to your home with our beautiful objet. Artfully distressed and with a bowl-shaped tail, this piece can work as a stand alone decoration or as a pretty resting spot for keys and sundries. How will you be embracing the truffle trend this season? For more inspiration on how to style this elegant colour, head to website at www.lauraashleyusa.com. This entry was posted in At Home, In Style and tagged colorful decor, colour, cushion, cushions, decor, decorating, decorative cushion, decorative cushions, fabric, Glamour, home accessories, home decor, Home Furnishings, peacock, peacocks, wallpaper. Bookmark the permalink.